To many people all over the world, and especially those who are fond of gambling, Las Vegas remains the premiere entertainment destination in the world. It's said that the only constant in Las Vegas is change. I try to visit Las Vegas at least once a year, and no matter how often I go, something will have recently opened or have recently closed, and something else is being renovated or changed. There is always something new to see, in fact just trying to see everything that has changed could consume your entire trip. If you've ever been to Las Vegas, you have experienced something many only dream of, so you already know what all the fuss is about. If you're planning a trip there, our Las Vegas Info should point you in the right direction, and perhaps save you some hard earned money. With so much to see in only three or four days, even contemplating a plan can be a daunting task so we will try to cover some of the more important 'NEED TO KNOWS'. 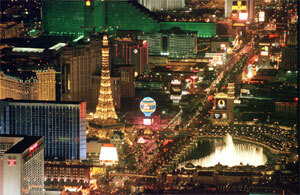 Las Vegas Hotel Info - The mainstay of the Vegas skyline, major hotels are major business in sin city. Learn more about the major destinations from our hotel-casino section. Las Vegas Show Info - there are two things to do in Las Vegas, gamble, and go to the show (ok, there's a third, but we won't mention it). Learn about how Vegas has adopted the show, along with reviews of some of the highlights, in our gambling guide. Las Vegas Coupons - clipping for your tripping. There are many little deals in and around Las Vegas that you wont ever know about without seeing the coupon. A couple of sites exist on the web to provide travelers with coupons before they even arrive in Vegas, and many places to find them once you arrive. Las Vegas Comps - Find out exactly how to get casino comps in Las Vegas, because if you're going to be there anyway, you might as well play a few hands of blackjack for free or get a few complimentaries for the slots at your hotel. Whatever it is, you're almost guaranteed to be 'comped' here there and everywhere in Vegas so enjoy! Las Vegas News & Weather - Get the latest news, weather information and updates. Our live news and weather feeds give you not only the latest local, state-wide and casino news, but also weather updates, forecasts and satellite imagery. Find out what's really happening in Vegas before you head on over there.